Scientists are monitoring changes in solar activity (graph) of the kind which, in the 17th century, resulted in a Little Ice Age. We cannot be sure that there will be a similar outcome this time, because humans have added some fundamental changes to our biosphere. One is the increase in atmospheric carbon dioxide, which is now 400 parts per million (ppm). It was 270 ppm before the Industrial Revolution. 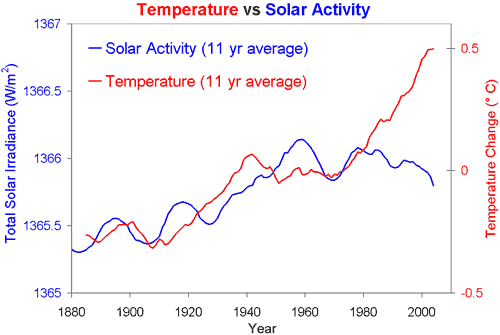 Sources: Global temperature red, NASA GISS) and Total solar irradiance (blue, 1880 to 1978 from Solanki, 1979 to 2009 from PMOD). The 17th century episode coincided with wars and social catastrophes (Parker 2013). Will this happen again? We cannot control what happens to the sun; but we can control what happens in and around our social galaxy, the one that humans were responsible for creating on Earth. If people were vulnerable to climate change in the 17th century, part of the reason was the disruption to their cultures caused by the feudal aristocrats. They trampled over people’s sustainable ways of living to extract the rents that people, in partnership in their communities, created by their labour. Today, we can re-set the sustainable ways of living by amending the rules that govern property rights. Change can be brought about by approaching human relationships in scientific terms. Oxford professor of economics Paul Collier, using the misleading terminology of fiscal language, puts it like this: “[Tax] the excess profits, or rents, at 99%. By their nature, rents are not a return on either capital or risk, so the company does not need to be rewarded for generating them” (Collier 2010: 88). A similar conclusion is reached by applying spiritual perspectives (McIntosh 2008). If people are sincere in wanting to heal the wounds inflicted on nature by past generations, they can reach a consensus on the tools that are needed. But disagreements will persist until there is an understanding of what is really at the heart of the environmental crisis. The problem is not ecological: it is cultural. Eco-cide is the collateral damage arising from an abusive social system that victimises most people.